Plotting a histogram using hist from the graphics package is pretty straightforward, but what if you want to view the density plot on top of the histogram? This combination of graphics can help us compare the distributions of groups. Let’s use some of the data included with R in the package datasets. 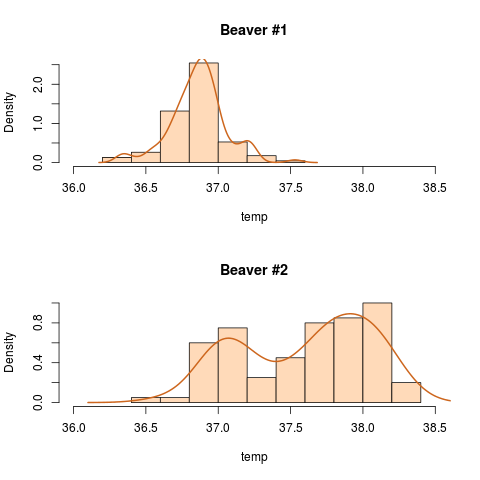 It will help to have two things to compare, so we’ll use the beaver data sets, beaver1 and beaver2: the body temperatures of two beavers, taken at 10 minute intervals. Now let’s show the plots for both beavers on the same image. 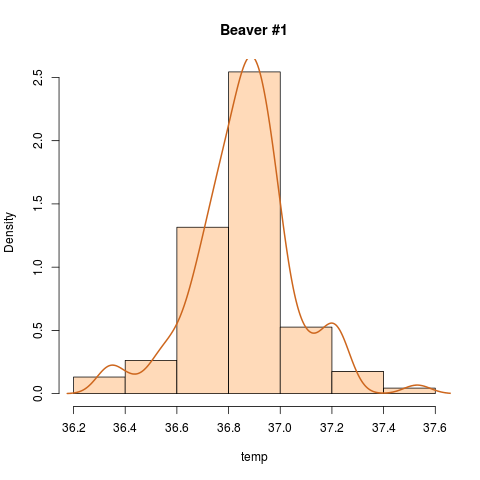 We’ll make a histogram and density plot for Beaver #2, wrap the graphs in a layout and png, and change the x-axis to be the same, using xlim.